Since our founding in 1965, we have been designing and building dies, jigs, fixtures and gauges to produce and inspect parts usedby many different industries. 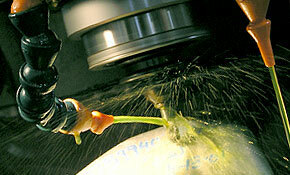 Our goal is to build tooling that is easy to maintain, cost-effective, yet produces consistant precision parts. A well designed and well built tool is necessary to achieve these goals. For this reason, we have our own toolmaking facility, Plant II. Weldments, castings, forgings and machined parts sometimes can be redesigned and be made as a stamping on progressive dies without sacrificing the integrity of the item. We can work with product engineers on these projects. We carry a large inventory of tool steels at all times. We do our own heat-treating in house which helps our turn-around time on new tooling and replacement parts. HAAS TL-Z CNC LATHE: 16" x 48"
Haas VF-11/50: X=120", Y=40", Z=30"
Haas VF-3YT/50: X=40", Y=26", Z=25"
(2) OKAMOTO - 16" x 32"